Just add a rice paddy hat. Instant Oriental-ness! Last week, we learned about the ill-conceived Lunar New Year-themed rice paddy hat display at the Bloomingdales at South Coast Plaza in Costa Mesa, California. The store quickly removed the hats when somebody (or perhaps many somebodies) informed them that this was a bad idea. However, it seems that the rice paddy hat-wearing mannequin thing might be some kind of really unfortunate trend in Orange County. 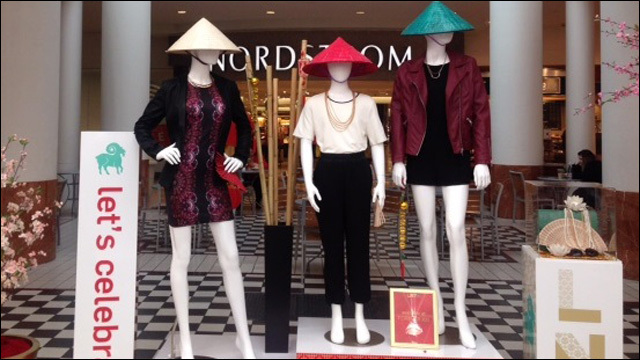 OC Weekly reports that the Forever 21 is the latest store to get down with the rice paddy hat trend. It's so hot right now. The above photo was snapped at the MainPlace Mall in Santa Ana. According to store employees, the hats were not their choice -- the display was apparently a decision from the corporate office. Forever 21 is not known for its cultural sensitivity. Like I've said, what better way to celebrate the lunar new year than to dress up some mannequins with a handsome rice paddy hat? When you're just too lazy to bother with all the things, it serves as a convenient cultural shorthand. Instant Oriental-ness! Happy Year of the Ram.